Yarn is such a versatile craft supply. It is used with various tools to create most anything your imagination can well, imagine. Knitting is probably one of the more well known craft techniques that uses yarn. In knitting you take two long needles, looms by hand or machine and form beautiful patterns with the yarn. These patterns of rows turn into hats, scarves, toys, afghans and a whole host of other compositions. Today I want to explore with you just a few of the patterns you will find on the knitting boards tutorial portal, here on Craftster. 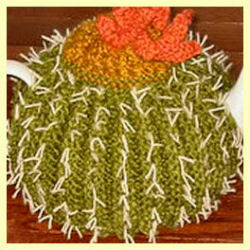 First knitting pattern to share, is this fun and funky cactus tea pot cozy, by wootwoot. Ponchos never seem to go out of style. 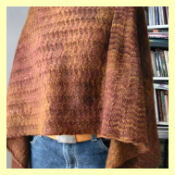 Especially when they are classic beautiful design poncho like this one by, starlings. The colors are so rich and warm, and work great with the herringbone stitch. Who does not like seeing cute babies in hats? Don’t think I want to know those people. 😉 Here we have one knitter sharing two little people hat patterns. 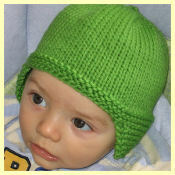 And ear flap hat and a spiral ribbed hat, by knitbit. Awwww! Too adorable! The bright green is such a good choice for this blue eyed cutie. I’ve found with phones it is hard to wear regular gloves. Taking them off and putting them back on is always recipe for losing one glove. The ones they claim are good for touch devices never work for me either. A great solution? Fingerless gloves! 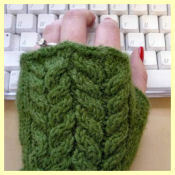 This pair of wiggle fingerless gloves by, lexer has a pretty cabling, and will let you use your device while being warm. Sometimes the places we work in are not so warm, so you could even use them while typing. Knitting dates back as far as Egyptian times, with a pair of knitted socks. Here on Craftster we have a whole section full of help and completed projects. Also you’ll find our tutorials for the basics, if you’re just wanting to try it out. Then you can click on over to our Pinterest knitting board to see more finished projects. Whether you’re a knitter from way back or just getting started, we have got you covered here on Craftster. So many patterns being shared you could knit non-stop and still never get them all. Thanks for checking out the Spotlight. Let me know if you have ideas for future articles.